Honeywell - HPA200 : Air Purifier Review • The Air Geeks, reviews of air conditioners, dehumidifiers and air purifiers. Well, Honeywell strikes again. The brand that boasts itself “#1 recommended by allergists” delivers its smaller-size air cleansers, for spaces ranging in the 250-350 sq ft. The HPA200 is a powerful air purifier that is based on the true HEPA filtration mechanism. This unit is optimized to remove most of the airborne particles before they reach your respiratory system. The exceptional effectiveness of this allergen remover makes it an ideal choice for allergic people. In case you are planning to buy an air purifier, then you should consider this exceptional system. The first thing that meets the eye is the design. Honeywell reworked its previously boxy design, and now produces a sleek, rounded-at-the-edges unit that looks very nice in a room. This is a non-negligible assets for those of us who insist on maintaining a clean, yet stylish, interior. As far as the specs are concerned, as you know, most of the highly effective air purifiers are based on the “true HEPA filtration” mechanism. This filtration mechanism is capable of removing 99.97% of airborne pollutants from the air. This means that the air it discharges is clean and free from a wide variety of common air contaminants. According to the manufacturer, the HPA200 is capable of removing pollutants that are as small as 0.3 microns. In addition, it is also suitable for trapping particles with larger sizes. With this air purifier, your room will be free from tobacco smoke, pollen, dust, fireplace smoke, cooking smoke, mold spores, and pet dander to name a few. Odors from your pets and daily household activities can ruin the environment of your living room or bedrooms. The smell from your kitchen can easily find its way into your bedroom and make the environment there unpleasant. 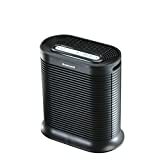 This air purifier uses an activated carbon filter to reduce bad smell before it dominates your rooms. It circulates air at an impressive rate to ensure that the air in your room is always clean and fresh. The odor absorbing pre-filter is also responsible for capturing large airborne particles such as dust and pet fur. Germs are harmful to our health and they should be eliminated by all known means. Some germs are airborne and they can be easily transferred from one person to another. The HPA200 air purifier is designed to capture most airborne disease causing micro-organisms. Failing to replace a worn out filter can affect the effectiveness of your air purifier. If you are a very busy person, you can easily forget to replace the filters. This system features an electronic filter replacement reminder to ensure that you don’t forget to replace worn out parts. Replacing old filters with new ones enhances the overall effectiveness of your air purifier. By using old filters, you will be allowing airborne pollutants to sneak their way into your lungs. You shouldn’t let them. Last but not least, we liked the smartness of the controls. This air purifier features a 2, 4, and 8 hour timer and a Turbo clean setting, in order to cater to the whole variety of needs you could have. It is worth mentioning that it is pretty compact (19.4 x 11.5 x 20.3 inches) and light (20 pounds), a very interesting feature for those who plan on moving the unit during the course of their day. Excellent performance for a small price. The HPA200 transforms your room by ensuring that the air it discharges is clean and fresh for a price tag under $200. Intuitive controls and smart functions, including the filter replacement reminder, which ensures that you don’t forget to replace old filters with new ones. Fancy controls control can be unresponsive. Some touch sensitive buttons of the HPA200 have low responsiveness, meaning you have to try a couple of times before the buttons respond. It turned difficult to get good replacement filters. Quality replacement filters are not readily available. Universal filters work on this unit, but they are of lower quality and don’t fully replace the original filters. It works. No seriously, it really works. I was a major skeptic only because there are so many on the market. How can you really know you have the best or the right one. 5days later I'm amazed to see how much dirt it has picked up. Pleased!!! Highly recommended. Severe Allergy sufferer. Asthmatic. Pet owner. Seriously dust covered house. Relief." I've been a life long pet allergy sufferer and have always dealt with it (mostly by staying away from pets eventhough I love them), but recently staying with family that have cats. I tried my best to tough it out and was ok until one morning I just simply could not breathe and had a severe asthma attack. 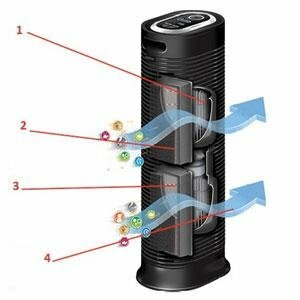 I bought this air purifier after doing some research and found out that the 'True Hepa' is what I needed, but I was still skeptical. I turned this thing on and within an hour I could feel myself taking deeper breaths. I've been carrying it between the bedroom and the living room for the time being. I can't say enough good things about this air purifier. My allergies are so minimal since I purchased it. It's really quite amazing. The purifier isn't so loud that I can sleep with it on the allergy setting. Turbo is a bit louder, but I don't even notice it when I'm awake. If you are an allergy sufferer like me and have been on the fence about trying one of these. This is a quality product that works." The Honeywell HPA200 is a powerful unit that delivers excellent performance. By combining highly effective filtration mechanisms, this system ensures that airborne particles, allergens, bad smell, and germs are eliminated from the air that goes through it. Suitable for smaller spaces, the HPA200 is satisfactory, even though some controls do not fully respond all the time. Still, for the price and the quality, it is definitely a good product.